In our last article, we shared some tips on launching a new website for your charity. Content is key when it comes to your site. Now, we want to share about how you can get your new content out in front of potential donors. How do you drive traffic to your site? 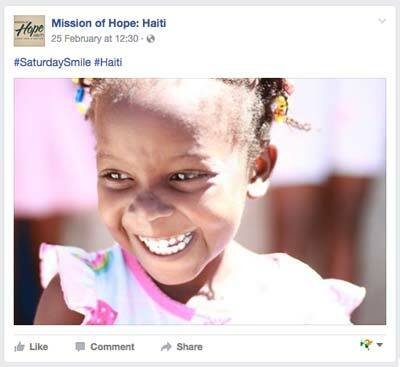 One of my personal favorite non-profits, Mission of Hope: Haiti posts pictures with brief captions every day on Facebook. Seeing their pictures in my feed reminds me to pray for the ministry, and when Christmastime comes around I always remember to support them because I’ve been reminded of their work all year. I realize it can feel overwhelming to think about posting a picture every day. Luckily, Facebook has some tools to help you out. Facebook provides a post-scheduling option for pages. If you want, you can take a few hours at the beginning of every month and schedule out all your posts for the next 30 days. If regular posting still sounds overwhelming, find someone who is familiar with your cause and ask them if they would be willing to help out by posting pictures and links to your website on your Facebook page. Mailchimp is your friend too. Mailchimp is an email marketing service that’s free to any account with an email list of under 2000 subscribers. If you’re a small charity, that’s probably you. Your email list is a great asset. Use it to keep donors in the loop. Tell success stories, request prayer, and remind donors about opportunities for giving. Create a basic email template to match your organization’s branding, then just drop your content into the template every time you create a new email. If you need help setting up an account or a template, let us know. We can set up your account and then hand you the reigns.